What happens when you take a concept developed to describe lacustrine ecology or fire regimes and apply it to complex social-ecological phenomena involving politics, economics, culture, and more? What challenges occur when concepts are borrowed from systems ecology or complexity science and applied to situations with people, power, perceptions, contingencies, and feelings? First, it traces the rise of the ‘regime shift’ concept in the study of social-ecological systems and its roots in dynamical systems theory. The recent rise of such systems approaches, facilitated by the work of the Resilience Alliance, has resulted in livid critiques such as that by Michael Watts (debates which remind me of 1970s debates between enthusiastic adopters of systems thinking in geography and their critics like Derek Gregory). Then, we propose a generic regime shift definition consistent with this alternative epistemology: a regime shift is a major, sudden, and persistent change in the tightly interrelated processes, functions, and processes that are perceived to characterise and/or maintain particular society-environment phenomena of interest. We also reflect on what ‘major’, ‘sudden’, and ‘persistent’ mean, and which ‘processes, functions, and processes’ are of importance. Finally, the paper proposes a typology that shows six ways in which analysts use the regime shift concept. People use the concept to analyse past changes, predict future trends, and describe desired pathways for change. They apply this to both material and conceptual worlds. We then give examples of each usage from the global literature on landscapes shaped by a strong presence of Australian acacia trees, but it fits just as nicely to many other phenomena (such as bushfire). 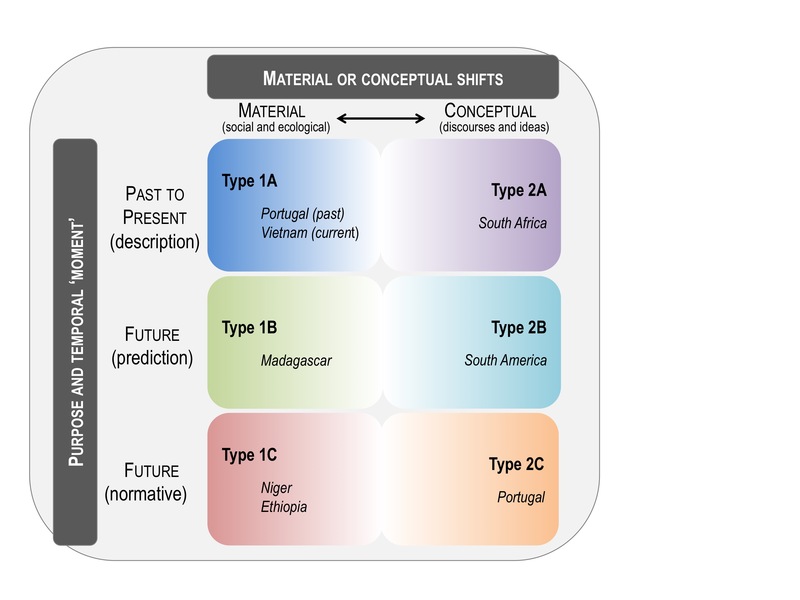 Here’s our typology of different ways in which the regime shift concept is used (the country names indicate examples discussed in the text relating to Acacia landscapes). This is Figure 1 in the paper. In sum, ‘regime shift’ can be a fruitful communicative tool an analytical tool, used in a variety of different ways to promote dialogue, discussion, prediction, and more detailed analysis. I wrote this article together with the core team of a collaborative project (funded by SESYNC, iDiv, and UFZ) that came together to investigate Acacia landscapes around the world. The inspiration for the piece came from our own struggles as an interdisciplinary team (human geography, biogeography, forestry, invasion ecology, landscape planning) in finding a common epistemological and conceptual ground to discuss the tumultuous social and ecological changes occurring in Acacia landscapes in Portugal, Vietnam, South Africa, and elsewhere. My co-authors in this adventure were: Christoph Kueffer, Dave Richardson, Sofia Vaz, Joana Vicente, and João Honrado. I thank them for their ideas, debates, and support over the excruciatingly long process to bring this piece (of which we are all quite proud) to press. This entry was posted on Wednesday, November 8th, 2017 at 9:25 am and is filed under Interdisciplinarity, Research. You can follow any responses to this entry through the RSS 2.0 feed. You can leave a response, or trackback from your own site.